The Vikings get a first half goal from senior Oscar Macias en route to opening round win. After consecutive losses to McMinnville and Glencoe to end the regular season, losses that ultimately cost Forest Grove the Pacific Conference championship and a top-8 seed in this year's OSAA state playoffs, the Vikings got back on the winning side of things with a 1-0 win over South Medford in the playoffs' the opening round. Forest Grove dominated the game start to finish, possessing the ball for the bulk of the contest and limiting the visiting Panthers' trips to their end of the field. But while pleased, Vikings head coach Gracey Mosquera was a bit critical of his team's inability to cash-in on what was ultimately a number of quality looks at the net. "I think we put a good performance out there, but we need to finish our chances so we can enjoy the game a little bit more and not have to worry in the last minutes," the coach said. 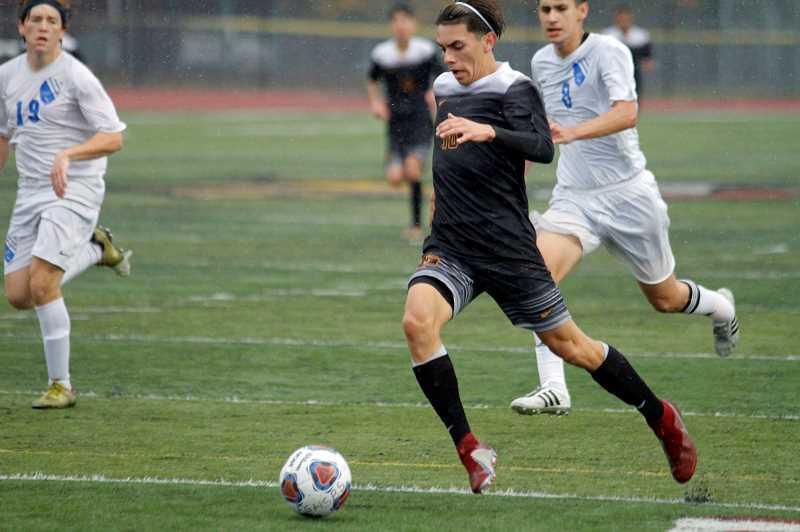 The Vikings standout senior Oscar Macias scored the game's only goal after a handful of opportunities, netting a 20 yard shot from the far left side, putting what appeared to be a cross into the bottom right side of the net in the game's 39th minute. From there it was a clinic as the Viks continued to possess, working the ball side to side, looking for quality shots while simultaneously minimizing South Medford scoring threats. The Panthers never really had a truly quality shot, but did manage a few free kicks late in the game, which in a one-goal affair, can often result in a game's equalizer. Despite the positive result, Mosquera noted his team would have to be more proficient scoring in coming games in-order to compete, but also noted his lack of concern regarding his team's effort to do so. "It's about being a bit more proactive," Mosquera said. "We're waiting for the ball to come to us and in the final third, the defenders are there to clear it out. So we need to anticipate, so we can put the ball in the net. We've done some training for that very thing, but we need to be more proactive and apply that work to the games." Following Forest Grove's loss to Glencoe in their regular season finale, there was some concern that the defeat might bleed into this game and negatively affect the Vikings going forward. But now, with the loss behind them and a playoff win under their belt, Mosquera believes his team's confidence is back and it's that confidence that will be instrumental in their success in games to come. "I think after losing two games in a row, it's tough mentally," said Mosquera. "But I think the kids are tough mentally, and that feeling of winning breeds that confidence, and that confidence breeds winning." And what's their mindset going forward? "We are excited for the next round," said the coach. "This is a party and we're invited, so if we're invited, we're going to dance." Forest Grove will play the Franklin/Gresham winner, Tuesday, Oct. 30.